Summary: These were never going to be great figures from the London estate-agency firm. However, at least WINK outperformed larger rival Foxtons while the favourable economics of the group’s franchising model remain quite clear. True, the immediate outlook for WINK is rather mixed and there is online competition to consider, too. However, all that seems priced into the P/E of 8 and 7%-plus income. I continue to hold. With November’s trading update containing a “moderate” profit warning and major rival Foxtons (FOXT) having issued glum figures, these results were never going to be spectacular. WINK blamed the downward performance on Brexit and higher rates of stamp duty, which combined to curtail property transactions and soften rents throughout London. During the year, the group earned 79% of its revenue from franchisees based in the capital. WINK’s franchisees earned revenue equivalent to 37% of FOXT’s revenue during 2016, up from 35% for 2015. I should add that WINK’s 2015 H2 was the group’s best ever, as buyers rushed to complete transactions before higher rates of stamp duty came into force. As such, the 45% profit plunge could be viewed as a ‘peak to trough’ reversion. While I had hoped this 50-50 split would be attained by lettings income growing significantly to match sales commissions, it appears the target may well be met during 2017 because of WINK’s lower sales commissions. WINK confirmed its estate-agency franchisees generated gross revenue of £46.1m during 2016 — down 6% on 2015 and back to the level witnessed during 2013. The 12% slice is represented by the standard 8% cut of franchisee sales and lettings income, with the 4% balance consisting of revenue from various franchisee support services alongside franchise establishment/re-sale fees. Certainly the group’s capital expenditure continues to be adequately reflected by the combined depreciation and amortisation charge used to calculate reported earnings. Meanwhile, cash absorbed into working capital still reflects the large sums lent to franchisees to help fund their individual businesses. Of the £1.4m diverted into working capital since 2012, I calculate £1m was lent to franchisees (net of repayments). The remaining £400k used for general working-capital purposes does not appear that great when total operating profit during the same time came to £8m. Last year’s chunky £1.1m dividend payout left the balance-sheet cash figure £0.2m lighter at £3m (23p per share), while the annual report confirmed outstanding loans to franchisees were £28k greater at £1.2m (9p per share). The lower combined total of cash and franchisee loans meant financial income dropped from £90k to £71k. 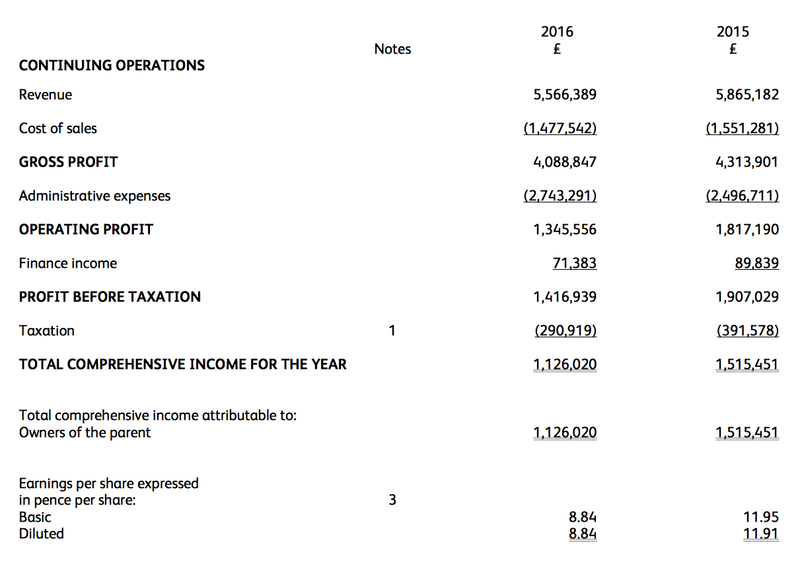 I had already noted within September’s interims that WINK was earning less from its loans and cash, but the £71k still represented a useful 5% of pre-tax profit. WINK management told me at the AGM that the firm would remain a “full service” agency, and the narrative accompanying these results confirmed that strategy is still intact. Needless to say, I have pondered for some time whether WINK will suffer at the hands of online/hybrid agents such as Purplebricks (PURP). My best guess of the future is that traditional agents may see their fees squeezed a little by online alternatives, but won’t endure complete destruction. As I see things, the major challenge that online/hybrid agents face is being able to grow their businesses without needing as many staff as traditional agents. You see, an individual estate agent can manage only so many property sales transactions to completion, and the lower fees charged by an online agency could mean its agents have to handle many more customers to earn a decent wage. And handling more customers may lead to a poorer service, chains falling through… and vendors effectively losing their upfront fee. Well, at least that’s my view — although I am a WINK shareholder and could be suffering from confirmation bias! Meanwhile, I have recently stumbled upon Property Industry Eye, which I have discovered to be quite an enlightening industry news website. In particular, the comments beneath the site’s articles are often informative for sector laymen such as me. For example, I had never really considered why PURP had struggled to make a go of its lettings division. But it seems letting agents require a nearby branch presence because of simple practical issues, such as contractors needing to pick up keys for property access and landlords being unable to host viewings themselves. That may be why PURP has recently bought a high-street lettings firm, which I thought was an interesting development. Taking WINK’s 2016 operating profit of £1.3m and applying the new 19% standard rate of tax gives earnings of £1.1m or 8.6p per share. Adjusting the £12.7m (at 100p) market cap for my £4.1m sum of cash and franchisee loans, I arrive at an enterprise value of £8.6m or 67p per share. Then dividing that 67p by my 8.6p per share earnings guess gives a P/E of 8. That rating does appear good value to me. Mind you, WINK’s immediate outlook was somewhat mixed. Although the group reckons there will be a “gradual improvement in sentiment” among property buyers during 2017, it expects rents in the capital to soften further. In the meantime, the trailing 7.2p per share dividend is only 1.2 times covered by my earnings guess — but supplies a 7.2% income. Here are a few points of interest. The fewer employees meant revenue per head edged up slightly to £174k, which would be impressive for most companies, but remains well below the £280k-plus WINK achieved between 2010 and 2012. Average employee pay advanced from £45k to £47k to represent 26.8% of revenue, versus 26.1% last year and between 21% and 23% during the years before. I see WINK has adjusted the reported pay of chairman Simon Agace. When I asked about Mr Agace’s apparent 2015 pay rise at the AGM, I was told he did not receive any extra money during the year and that the reporting of his PAYE had differed. Seems like the reporting has reverted back to what it was. There was nothing else that notable among the other directors’ wages (although see point 5 below). Trade receivables that are past their due payment date represented 42.7% of all trade receivables owed, which is lower than the 48.0% figure for 2015 and the lowest proportion since 2011. That said, total trade receivables as a proportion of revenue was 11.5% for 2016, versus about 10% for the previous three years. WINK’s collection of franchise income (from property sales/rentals) is collected by the group before being dispersed to the franchisee. As such, I guess the outstanding trade receivables relate to the monthly payments paid by the franchisees for other central services. Oh dear — what has happened here? …and so have binned them in the hope nobody would notice in the annual report. It’s just plain wrong for the annual report to now say the board “approved the grant” and give the impression the chief exec never received them. Clearly the directors had felt the 200p option target was achievable, but no longer do. That’s a bit unkind towards shareholders who had used that options RNS announcement to help judge the investment attractions of the share. WINK sneaked in a £106k write-off within these results. The £106k difference was created by WINK effectively writing-off a franchise investment that originally cost £164k and had £58k already amortised. I suppose WINK did not want to bring attention to the write-off. But it does mean the reported £1.3m operating profit was understated by a not insignificant £106k. I think it’s really quite difficult to work out what effect the likes of Purplebricks will have on the estate agency market. I have no idea what sort of market share they will end up with or whether they will be profitable. However, PURP’s differentiated business model (and the differentiation is as much a matter of perception as reality) is changing that. They are competing aggressively on price. And I think this is likely to blow apart the industry standard commission model. The implications of that are quite severe. It will turn estate agency into a scale driven business. Because at the moment even quite a small agency is profitable. But if average fees are cut in half (which strikes me as a very possible outcome) then that will not be the case. Estate agents will need to have high numbers of transactions per branch to make a reasonable profit. Now, you may disagree with this and say that traditional agents offer a better service. I don’t agree, but I can understand the argument. But, I don’t see how the arrival of a credible, well funded competitor selling on price can do anything other than dramatically change the economics of this industry. And anecdotally, it’s already happening. I live in a relatively leafy suburb of greater Manchester. We are forever getting estate agent leaflets through our door. A couple of weeks ago, we got one from an agency called Gascoigne Halman. It’s a reasonably well known local chain. And it was offering their new fixed price £700 selling service…. Now, WINK is very cheap. I still think you’ll do well in the share and the likelihood of a bad outcome is pretty low. But for me as an investor this industry is now much less predictable and much less attractive than it was before PURP arrived. Great Analysis Maynard & I like your additional comment Phil. I bought WINK at 102 just recently. This will come good unless it turns out the Estate Agent model as we know it is dead or housing sales die off. Both are not likely in my view and even with the PURPB like changes in the future, the WINK model seems better suited than many to weather the storm..
More contradictions about the options granted to the chief exec during September 2016. Essentially they were granted, then the annual report said they weren’t, and now we’re told they were granted but have now been foregone. “M Winkworth plc (“Winkworth” or the “Company”), the leading franchisor of real estate agencies, provides the following update on its share option scheme. On 13 September 2016, options over 636,662 0.5p ordinary shares in Winkworth were granted to Dominic Agace, Chief Executive Officer of the Company. The options were exercisable at a price of 200 pence per share with effect from 13 September 2019. Subsequent to the appointment on 17 October 2016 of Andrew Nicol as Chief Financial Officer of the Company, the Winkworth board of directors has decided to restructure the award of share options to senior management. Accordingly, Dominic Agace has agreed to forego the options over the 636,662 shares previously granted. Under a restructured arrangement, on 10 May 2017 Dominic Agace was granted options over 210,000 0.5p ordinary shares and Andrew Nicol was granted options over 150,000 0.5p ordinary shares in the Company. These options will be exercisable at a price of 150 pence per share, with effect from 10 May 2019 and expire on 9 May 2027. Point 5) of my annual report review noted that the options referred to in a September 2016 RNS were in fact “never formally granted“. However, this latest RNS now suggests the options were indeed granted but the chief exec has now foregone them. He has accepted a restructured arrangement instead. I note the restructured arrangement involves the options coming good at 150p instead of the original 200p as announced originally in September 2016. Oh well. At least the new arrangement involves less options, 360k versus 636k. 1.8p per share matches the comparable Q1 payment of last year, which I hope suggests the business is not struggling too much with any slowdown within the London property market. I hope the remaining payments for 2017 can be sustained at 1.8p per share, too. I think it is fair to say the TrustPilot issue with PB does look somewhat fishy. I did look at the TP reviews some time ago, and what struck me as odd was the general quality of the grammar and the correct punctuation, etc. Most online reviewers don’t bother with such niceties, but I suppose if you are being paid to submit comments then perhaps you would want to be seen to be doing a proper job. Anyway, I note from your extract that Paul Smith, Mr Starkey and Clive appear at the top of the table and also at the bottom. I am not sure whether the data-entry monkey became bored with user names as well as the adjectives in the review title. I think the estate-agency market will polarise over time, and there will be PB and other cheap options on one side and decent traditional agents on the other. Traditional agents that simply can’t justify their fees will disappear, which may actually benefit the better traditional agents. I am pretty sure traditional agents will not all disappear, because selling a house is not like selling a BMX on ebay. There will always be some people who will want an estate agent to handle the sale, vet potential buyers, negotiate the price etc, because they are too busy, too unsure, live too far away from the property, etc, to effectively take the DIY option with PB. Other industries have survived online competition. Look at traditional auction houses as seen on Bargain Hunt. Surely these should have disappeared by now what with the advent of ebay. Perhaps auctioneers in general have lost some business, but their specialist experts — with various contacts and knowledge etc — are still probably best placed to help you sell your old grandfather clock. Indeed, traditional auction houses now offer online bidding when items go up for sale. So I guess they adapted to the online changes and as far as I can tell, have survived. I dare say estate agents will adapt, too. Many have now started to offer a PB-type package, which can then convert into a traditional fee service should the vendor change his/her mind. I think such developments will help traditional agents survive — or at least the better ones that deserve their fees. Hi Maynard, apologies about your response not showing up sooner, it got stuck in my approval queue. Pure laziness on my part in not checking and approving until now. As much as I would like to write-off Purplebricks as hype, I think any investor in traditional estate agents would be foolish to do so. Instruction growth at Purplebricks has been unprecedented, which is all the more impressive given that we’ve been in a slower property market (in terms of transactions) since the stamp duty changes took effect last year, statistics on gov.uk back this up. This recent article (http://www.propertyindustryeye.com/countrywide-still-uks-largest-agent-by-inventory-but-only-just-as-purplebricks-leading-agent-by-sales-agreed/) commented on a Jefferies broker report that suggested that Purplebricks were in third spot as of March 2017 with 10.17k current listings on this website. I don’t have access to the broker note, but as of today, just four months later, I see 15k+ listings on the Purplebricks website. That suggests to me that sooner, rather than later, they will be Britain’s leading estate agent by listings. Purplebricks are obviously doing something right. If you want to keep tabs on Purplebricks instruction growth, you can eyeball the total number of properties they have listed on their website – https://www.purplebricks.co.uk/search?ref=header#?q&location=&page=1&searchType=ForSale&sortBy=2 I should really write some sort of program to automate the tracking on this number, but you can take it from me, it’s been going up steadily in the last since I’ve started keeping tabs on it as of early this year. Make of this what you will, but the most feedback I ever received on anything I wrote has been on Purplebricks. In particular, the feedback from estate agents was interesting. A few contacted me on Twtter to take things further. They absolutely hate Purplebricks with a passion, they claim it provides an inferior service, use unscrupulous advertising practices, and will bill customers regardless of whether the property sells or not. This could be true, but equally, it could be sour grapes at having their own business undercut? I would agree, I would not write off PB, nor would I dismiss the general effects of online rivals on traditional agents. But I do think the sector will probably polarise into two, with online on one side and traditional on the other. There will be many traditional agents going by the wayside in the meantime, and those that are left will be the ones that can really sell properties and earn their fees. I have read the article (and the lengthy stream of comments) and there are a lot of issues (genuine or potential) that could influence the data. For a start, any agent may have many listings simply because its stock has not sold, or perhaps it delays removing the property listing after completion so as to help sustain an online presence. The most efficient agent my have a low listing share purely because its instructions convert to actual completions — and then disappear from the portals — much more quickly. There is also some questions about just when a property listing becomes SSTC, which effects the SSTC/listing ratio cited in the article. While I would say PB has been impressive gaining instructions, what counts ultimately for the customer (of PB or any agent) is the likelihood of a sale completing at an acceptable price. Research on that would be much more informative. The article comments on Property Industry Eye back up your experience of traditional estate agents hating PB. There will be a certain degree of sour grapes there, but I do feel they have a point with the unscrupulous claims as PB has had its wrists slapped by the ASA on various occasions. Trouble is, as somebody on your site commented, you can build a big business using spurious claims before action is taken. You have to be careful of the definition of ‘sell’ with estate agents. PURP trumpet the conversion from instruction to sale agreed as 86% in its latest presentation, but that is sales subject to contract. What of course matters to the vendor is the likelihood of converting the instruction into a completion. That is where things become murky with PURP. 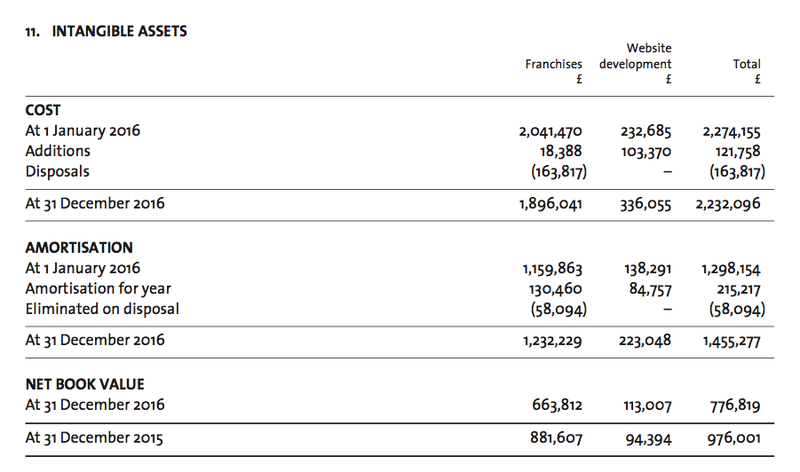 You see, unlike quoted agents Foxtons, Countrywide and LSL, PURP does not disclose completion numbers. Such figures are apparently “commercially sensitive” to PURP and I think the boss suggested in the recent results presentation that their disclosure could confuse observers given the high rate of growth the business is experiencing. I would argue that if PURP wanted to dismiss the ongoing allegations of it being simply nothing more than an advertising gateway to Rightmove, then the firm’s completion numbers ought to be disclosed. Observers would then be able to make their own judgement as to whether PURP can convert instructions into actual completions. I mean, the boss claims PURP leads the way on transparency, efficiency etc, and yet he shys away on publicising the most important stat for his potential customers — how likely will I complete on my house sale through PURP? Anyway, from the latest results presentation, PURP did state it had “sold and completed on £5.8bn (2016: £2.77bn)“, which suggests the firm sold and completed on property worth £3bn during 2017. Let’s say the average completion price was £225k — about the UK average. £3bn divided by £225k gives 13.3k completions. PURP also disclosed annual revenue was £47m and average revenue per instruction was £1,088. That suggests instructions came to 43k during 2017, although it is not clear whether revenue is supported by non-instruction revenue. Anyway, 43k of instructions versus 13.3k of completions equals a 31% instruction to completion rate. I am not sure that is impressive. I have seen talk of a general industry 60% figure, but who knows whether that is true? I guess the dilemma for vendors is whether they pay upfront for what appears to be a low chance of a completion. All told, I think the foundations of PURP’s business are somewhat shaky and it may only take a little bit of bad trading news to thump the valuation and make raising further funds for expansion somewhat difficult. Maybe there will be life in the traditional estate-agent sector after all. Nothing unusual here, with the same 1.8p per share payout as the previous 5 quarters. I guess the full-year payout is heading for 7.2p per share, to match last year’s level. Whether earnings are heading for the same level as before is another question of course.